As I crumbled the soft deep orange bar with a paper flag of differing countries embedded in it, I smelled a wonderfully spicy blend of what smelled to me like oranges, peppermint or eucalyptus, and some eastern Indian spices. When I got in the water, this is a bar that I could feel working on my sore muscles in seconds. The smell and the feeling of the bars ingredients reminded me of the now discontinued Lush ballistic “Fizzy O’Therapy”, which had mustard seed oil in it. But Marathon is better. During this bath I wondered if this Marathon bar had mustard oil as well and apparently so. This bar makes a very noticeable difference with regard to sore muscles and being achey. If you’ve just run a Marathon or done any work that makes your muscles achey and sore, Marathon is a great one to have around. It reminds me of the feeling of that old nasty aching muscles rub called “Deep Heat”, not the smell but the way it made your muscles heat up in a very noticeable way? Yep. Marathon smells like…Fizzy O’Therapy ballistic. I can still feel it’s effects and it’s been an hour since I got out of the tub. It’s heating properties keep going even after the bath. Because of attractiveness, bath water color, and mostly the way it works, this bubble bar gets 4 stars from me. Notes: “Marathon” and “Wiccy Magic Muscles” cinnamon and mint massage bar are a team for sore muscles. Ingredients: Sodium Bicarbonate, Cream of Tartar, Sodium Laureth Sulfate, Lauryl Betaine, Glycerine, Cinnamon Leaf Oil, Olive Oil, Cocoamide DEA, Peppermint Oil, Witch Hazel Extract (Hamamelis virginiana), Aloe Vera Gel, Mustard Oil, Myrrh Gum, Oilbanum Gum, Benzoin Gum, *Cinnamyl Alcohol, *Cinnamal, *Eugenol, *Benzyl Benzoate, *Limonene, *Linalool, Perfume, Gardenia Extract, Colour 59040, Colour 14700, Paper Flag. Lush Times Summer 2006 description: Refreshing, warming minty bubbles to help you warm down after exercise. Crumble under running bath water for mounds of fragrant bubbles. Ingredients: Sodium Bicarbonate, Citric Acid,Perfume, Olive Oil, Hemp Oil , Grapefruit Oil, Bergamot Oil, Frankincense Oil , Lemon Oil , Orange Flower Absolute, Mandarin Oil. Review: This is quite simply, the best ballistic I’ve ever tried from Lush If I’m not mistaken. I love the combo of the two Lush products together. Lush doesn’t do this combining very often. Lush “Fun with a twist” fun bar comes to mind. This bath bomb is a slooooow fizzer which is nice because it lasts the whole bath. And it’s more of a foamer than a fizzer. The combination of the lovely orange “The Olive Branch” scented side, and the sunny yellow “Happy Hippy” grapefruit scented side is a FABULOUS scent. It was actually softening to my skin. I dont’ know, not softening in a “Butterball” way, but in a “bicarbonate” way. Absolutely lovely. The scent stayed on my skin through the next day. 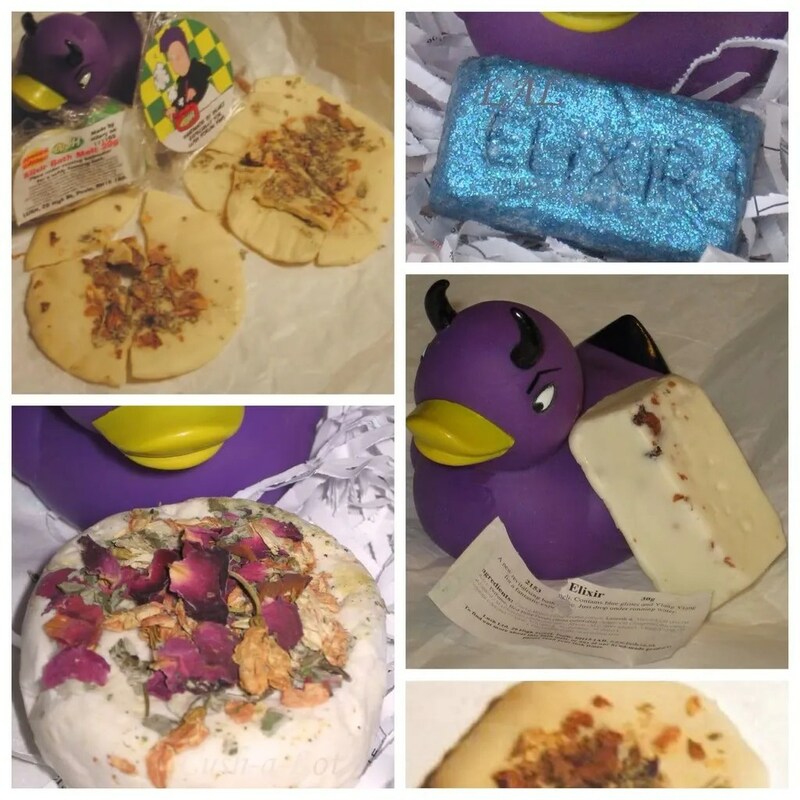 Noriko with Lush had created this one. 2006 Lush Times description: New shape, new concept, two of our favorite fragrances combined by Noriko to bring a bit of sunshine to gloomy days. Pop a Happy Pill to cheer yourself up, but pop it in the bath instead of a glass of water. The orange side is the mandarin fragrance of Olive Branch and the yellow side is our gloriously grapefruity Happy Hippy. It’ll keep you going until the spring flowers show their smiling faces. Here’s the video, it’s such a pretty things in the bath.